In response to a practice that many claim is a form of racial discrimination and a hindrance to the basic human right of education, a rapidly growing campaign has emerged to restrict questions about criminal histories: the “Ban the Box” movement. While the current campaign is the genesis of the group All of Us or None, a grassroots organization of formerly incarcerated people and their families with a focus on employment, the scope of the movement has since widened. Propelled largely by the group Students for Ending Mass Incarceration (SEMI), Wesleyan now stands among many colleges now involved in “Ban the Box” activism. “Should a crime make a human life suddenly disposable?” SEMI member Francesca Woodbridge ’20 asked. At the heart of the contentious debate lies the question of whether or not an applicant’s criminal history should be provided on college applications. Back in 2006, the Common Application added questions concerning the criminal convictions of applicants. Many have questioned the intent of asking for such information. Since 2015, and more significantly during the past year, SEMI members have begun petitioning Wesleyan to remove these prompts from the Common Application. The option to opt-out is left up to each individual college or university administration. “There are a lot of reasons SEMI started, but I guess after the push for divestment from private prisons that happened during the sit-in in Roth’s office (Spring 2015), a group of students realized that there was no activist group solely responsible for raising awareness about and challenging the University’s role and complicity in mass incarceration,” said SEMI member Tedra James ’18. 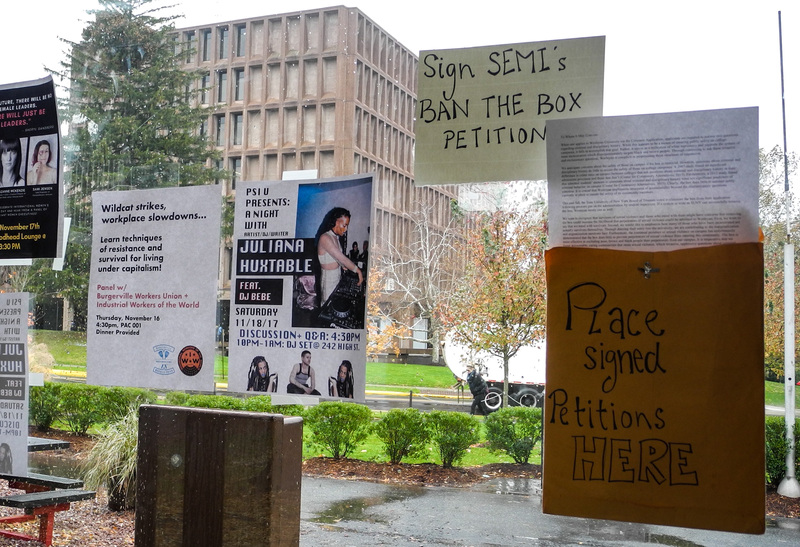 SEMI created a petition for the “Ban the Box” campaign for students and faculty at Wesleyan, which has already received significant support from a variety of different clubs and academic departments on campus. Similar “Ban the Box” campaigns across the U.S. have found success– including initiatives in New York and Louisiana–which serve as foundations for the work done by SEMI members. NYU has set a significant precedent for advocacy against “the box,” as a large private school. This past August, NYU announced that rather than broadly inquire about an applicant’s history of criminal offense, in its initial evaluation of an applicant it will ask applicants only if, in the last seven years and after the age of 14, they have ever been convicted or plead guilty to a violent crime. “Especially in the context of high rates of school discipline and incarceration among people of color, it seems vital to pose two questions about the checkboxes: do they, in fact, have any predictive value, and does their presence work against universities’ mission as engines of social mobility and diversity either by discouraging applicants or by resulting in unjustified denials of admissions on the grounds of safety or integrity?” New York University’s Vice President for Enrollment Management MJ Knoll-Finn inquired in a letter to the chairman and the chief executive of the Common Application. Beyond campus debate, Louisiana made history this fall as the first state to “Ban the Box” statewide on college admissions applications. Although Louisiana law still allows for an inquiry into students’ criminal history after admission, prohibition during the process is certainly a step forward for the “Ban the Box” campaign. When attempting to debunk preconceived notions about the box, SEMI and other advocacy groups have employed a number of strategies. Additionally, a 2013 Rand Corporation study funded by the U.S. Department of Justice suggests that increased access to higher education reduces recidivism rates. Those against “the box” claim that it blatantly targets students of color, creating more obstacles for people who are already most susceptible to the school-to-prison pipeline. Supporters of “the box” deny the racial bias others claim is implicit in such questions. In response to such arguments, many “Ban the Box” supporters cite that the United States has 20% of the world’s prison population and only 5% of the world’s population, a clear indication that questions prompting information about criminal convictions affect a much wider range of Americans than many would believe. Within this prison population, there is a blatant racial disparity: people of color make up 37% of the U.S. population but 67% of the prison population. “In light of the documented racial disparities and implicit bias evidenced at every stage of the criminal justice system—from referrals to arrests to convictions—it is especially troubling that this might serve as a barrier to higher education,” Brenda Shum, director of the new initiative at the Lawyers’ Committee for Civil Rights, said. “As college students, we know that the box does not protect rapists from coming onto college campuses, so how much can a box really do?” SEMI member Lola Makombo ’20 said. Makombo further explained that questions of what happens to people who are perpetrators of sexual assault and are allowed on campuses remain disputed within the “Ban the Box” campaign. The Incarceration to Education Coalition (IEC), an NYU student group working to prevent discrimination against applicants with criminal histories, expands on how sexual assault factors into the debate. One of the biggest cases that proponents of the “Ban the Box” movement point to in garnering support for their cause is recent research conducted by CCA. CCA has invalidated the assumption that there is a correlation between crime on campus and students with criminal histories. Despite such conclusions, this past May, Maryland Governor Larry Hogan vetoed a college-application bill, which passed both of the Democratic-majority legislatures with bipartisan support, that would have halted inquiry into college applicants’ criminal histories. “Most alarmingly, the legislation does little to differentiate between those with a violent felony, such as a sexual assault conviction, and those with a non-violent misdemeanor on their record,” Hogan wrote in his veto letter. Yet, proponents of “Ban the Box” recognize that racial bias is still prevalent in the separation of these two categories. Although SEMI’s last teach-in was in 2015, members hope to bring back the forum in the near future. Claudia Stagoff-Belfort can be reached at cstagoffbelf@wesleyan.edu.